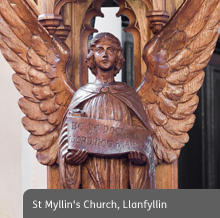 Follow in the footsteps of the many pilgrims and other remarkable people who created and shaped the fifteen churches and chapels on the Meini Bywiol Living Stones Trail. Your journey takes you across more than a thousand years of faith, history, architecture and craftsmanship contained within unique buildings that are not museums, but 'living stones' that remain consecrated places of worship at the heart of their communities. Visitor to the churches and chapels will not only be visiting the buildings, but the magnificent landscape in which they have been built. The sacred buildings of Wales are often isolated, simple buildings, lost in the landscape and inseparable from it. Although some are located in the centres of villages, the sites of churches or chapels were often chosen for their remoteness, as places for reclusive prayer. They retain a powerful sense of place and encourage us to see holiness in the landscape. 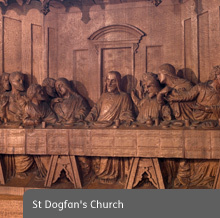 The churches are dedicated to saints who lived in the fifth and sixth centuries, a period known as 'the Age of Saints'. These holy men, often born to the princely classes, established holy communities where younger pupils came to learn and lived a monastic lifestyle. The name given to this sort of educational community was a 'clas', and they served as missionary centres for surrounding daughter churches. 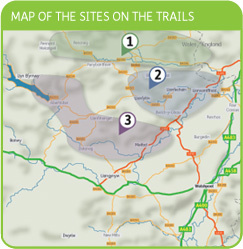 Several churches on the Trail were clas communities: St Tysilio and St Mary at Meifod, St Dogfan at Llanrhaeadr-ym-Mochnant and St Silin at Llansilin. 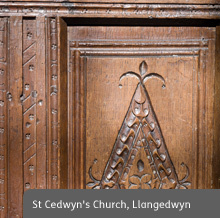 The daughter churches were often named after the missionaries who founded them, such as St Cedwyn and Llangedwyn. 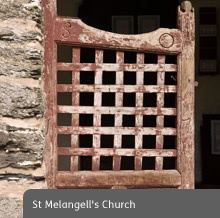 The Celtic church held women in equal esteem; Melangell was a missionary who founded a nunnery at Pennant Melangell. Most of the buildings on this trail have the power to fascinate us with the layers of different architectural styles and materials laid down over centuries. Finding the remaining 'bits' of the earliest church in the core of the building, knowing it has been there for hundreds of years, and understanding how the building has developed around it, gives the visitor a tangible link to a long historic narrative. The oldest churches on the trail, St Tysilio & St Mary, St Dogfan, St Garmon, St Ffraid, St Silin, and St Melangell all have immense heritage value rooted in longevity. The building may be an interesting example of an architectural style (such as Seion Chapel, The Ann Griffiths Memorial Chapel, and St Myllin's Church) or it may have associations with a famous architect (such as Christ Church, designed by Gilbert Scott). Where buildings are concerned, with age comes beauty! The weathered stone showing decay, honoured by time and the patina of age, cannot be fabricated. The Victorians tried – most of the pre-Victorian churches on the trail went through a decade of 'makeover' in the nineteenth century when they were given a dose of architectural 'anti-wrinkle cream'! This adds another layer of interest, particularly as we can often compare the 'before and after' with old photographs and sketches made by enthusiastic contemporaries. The buildings on the trail have a story to tell about both the ordinary people in the communities around them, and the moments when they became caught up in national events. The names and occupations of ordinary people are recorded in the gravestones. The skills of local craftsmen (and later women) are recorded in the bricks, glass, carved wood and stone, and metalwork of the historic fabric of the building. The valleys on the trail may be quiet now, but they are border parishes and have seen border and national conflict. The first church of St Silin was razed to the ground after the rebellion of Owain Glyn D?r in the early fifteenth century. 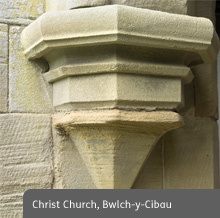 Churches in all three valleys saw conflict during the civil war of the seventeenth century, and this had a dramatic effect on their stones, timber and glass. St Silin's Church still has bullet holes in its door from when Royalist forces tried to break in to capture Parliamentary soldiers barricaded inside. Pendref Chapel was torn down when simmering embers from the civil war flared up during the Jacobite rebellion in 1715. 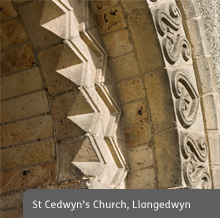 St Wyddn's Church has a unique heritage rooted in the urban growth of Victorian cities and huge feats of engineering. The church was built to replace the flooded village when the Vyrnwy dam was constructed in the 1880's to provide Liverpool with water. Some of the chapels on the trail were built by early non-conformists. The John Hughes Memorial Chapel is an early example of a registered place of worship formerly used as a domestic or school building. 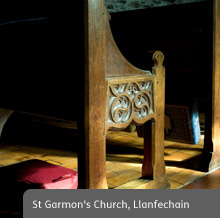 Pendref Chapel is one of the first non-conformist chapels in Wales and has played a part in the story of Welsh independence. The Independent movement had a part in the move to disestablish the Anglican Church of Wales during the nineteenth century. 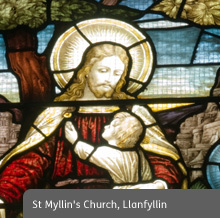 Border parishes such as St Silin covered parts of England and Wales, and part of its heritage is the story of the disestablishment and disendowment of the Church of Wales at the beginning of the twentieth century and the formation of the Church in Wales.